It’s been a decade already, but Greg Leffel’s book Faith Seeking Action: Mission, Social Movements, and the Church in Motion continues to find its way deeper into the conversation at the intersection of faith, social change, and theo-politics. Based on case-studies of the early 2000s Antiglobalization movement against international corporations and finance, public policy, and their detrimental effects on labor, the environment and culture; the 1980s Sanctuary movement sheltering undocumented refugees from the war zones in Central America; and a movement of house churches beginning in the 1970s, Faith Seeking Action remains relevant to the many questions about faith in public life in an age of Trump, Brexit, and xenophobic hysteria. It’s principal focus is the architecture of social movement mobilization, addressing the six crucial variables that organize and mobilize effective collective action. But it is also a conversation between a new theological understanding of the church and emerging social movement theory. This is an academic book for sure, but its ideas are finding their way to popular audiences partly through the speaking and writing of Brian McLaren. His 2016 book The Great Spiritual Migration: How the World’s Largest Religion is Seeking a Better Way to be Christian devotes a chapter to covering the basics of Faith Seeking Action. 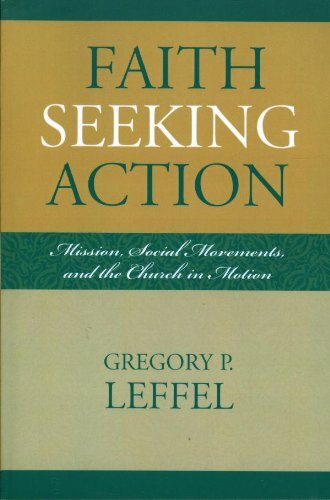 Faith Seeking Action: Mission, Social Movements, and the Church in Motion — Gregory P. Leffel, Ph.D. Available at Amazon.com in paper and Kindle versions. For a sample from the Introduction, click the headline above. Timelessly, a tumbling stream carves a canyon through a rocky escarpment in East Tennessee. There, where the Appalachian foothills descend steeply into the Sequatchie River valley, and cradled beneath these stony bluffs, a wooded sanctuary rises along the stream as it races past, downward to meet the river. Moonshadow stands guard over this fragile mountain preserve, a sprawling, earth-hugging dwelling assembled from hand-cut rock and timber pulled straight up from the ground upon which it sits. Cooled by the forest’s summer shade, its winter heat radiating from its massive stone fireplaces and from the sunshine stored in its rock foundations, Moonshadow is a model of environmental sustainability. Its book-crammed living room and its well-stocked kitchen form its heart, the vibrant living center of a busy environmentalist community. Amid organic permaculture gardens, wattle-and-daub bungalows, solar collectors, and the other accoutrements of a self-sustaining life, Moonshadow’s eco-activists demonstrate living without destroying their habitat. And this living witness is passed on to outsiders: Moonshadow activists teach sustainable life skills through their Sequatchie Valley Institute’s on-site classes and intern programs; and thus they manage to multiply their public influence. In addition to their local work, they also participate in the broader environmental movement. Some, on occasion, take part in disruptive direct action protests. A few belong to the movement’s radical Earth First “no compromise” faction. Not long ago, Moonshadow’s eco-community hosted a community-to-community dialogue on the environment. Participating with Moonshadow’s non-religious activists was Communality, a Christian community—my own community—of missioners. The dialogue’s purpose: to break down stereotypes between religious and non-religious groups, clarify pressing issues related to the environment, learn from one another’s experiences, share beliefs and values, find common ground. “What’s at stake,” said Moonshadow’s activists, as dialogue turned to the question of their movement’s vision and motivation, “is the future of the world . . . the future of life itself . . . the danger that we may all destroy ourselves.” As a consequence, the horizon toward which their movement journeys is the transformation of the very way the world lives, its values, its use of the earth. Their movement’s end—its eschatology—is a sustainable future made possible by saving humanity from itself. “This, on a global scale,” added Moonshadow activist john johnson (who does not capitalize his name because he does not believe in capitalism), “is an overwhelming task. It’s like a never-ending war out there.” Nevertheless johnson and his compatriots faithfully invest their lives in a world movement whose end they will never live to see. There are obvious differences, of course, between the historical Christian movement and the modern environmental movement. These are not exclusive differences, but they are important ones. Noting what we share in common, though, raises an intriguing question: Is it possible that the church, as it bears witness to the gospel of the reign of God, has something to learn from—and maybe even something to contribute to—contemporary social movements and social movement activists? Without hesitation my answer is, Yes. . . . And researchers on both sides of the secular-religious fence share the intuition that understanding collective action generally, and social-political-religious movements particularly, is indispensable to understanding social evolution and development. Might these movements themselves, even, provide the indispensable plus value that keeps our vital societies vital, and our well-being well, and that revitalize us when we lose our way?